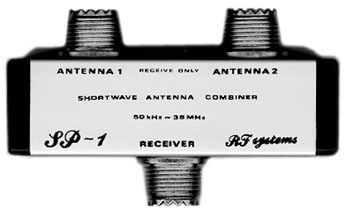 The RF Systems SP-1 allows two shortwave receivers to be connected to one antenna without interaction and with minimal signal loss. A very high degree of isolation (over 30 dB) between both receivers ensures that each receiver can be tuned and operated as if it were connected to its own antenna. The SP-1 can also be used in reverse. That is, as an antenna combiner for two antennas to one receiver. This device is operational from 50 kHz to 35 MHz. This is a passive (not amplified) device. The SP-1 uses three SO-239 jacks. Click here for specifications. Copyright 1999-2014, Universal Radio, Inc.